This is a story of debuts - a highly-anticipated debut performance following the launch of trumpeter Noel Langley's debut album, Edentide. The anticipation had partly been because this was extraordinarily veteran Langley's first outing as a bandleader and secondly, from fans of his album, speculation and curiosity about how Langley would go about the task of bringing this music to audiences in a way that would satisfy them. Langley spoke to London Jazz about this performance here: (link below) and revealed another surprise - that this was going to be a sextet performance. Considering that the album itself consisted of the efforts of 21 musicians and Langley's distinctive sound and experience is tied in strongly with the lushness and power of big bands, there was some trepidation and concern that the music might not be well-served by this highly distilled format. 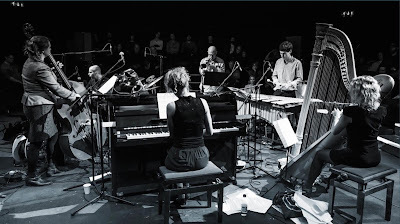 But we needn't have worried - Langley's ears are ears to be trusted and in the intimate space of the Cockpit theatre, with the musicians facing each other as if in a ring of meditation, the sextet captured all that is important in the music and served it generously to a grateful audience. Although the set remained true to the album, there were clever surprises and adaptations, including multi-tasking musicians and brand new tunes and arrangements. Langley himself was surrounded by hanging gongs and percussion instruments, which he used sensitively and effectively as the first tune, For The Uncommon Man whispered its way into the space. The tune gently introduced each of the exceptional musicians with Ralph Wyld (vibes), Ruth Wall (harp) and Alcyona Mick (piano) coming together and flowing apart into their distinctive sounds effortlessly. Moving to The Turning House (Langley/Wall), the thrilling distinctive sound of Asaf Sirkis (drums) raised the energy of the whole room. The rest of the set echoed the album with Langley's compositions of Sven's Island, Minami and On Haast Beach, new arrangements of which captured the essence of each tune fully. Langley himself was on good form, his sound often swelling from sweet nothings to big round notes that bubbled up from the ground of the stage. The set ended with Edentide, which on the album ends with the tune The Lord is My Shepherd (Crimond) but here, Langley replaces this with the first movement, Opening, of Kenny Wheeler's Sweet Time Suite as a tribute to a man very close to Langley's heart. Halfway through the set, bassist Charlie Pyne, a joyful and solid figure throughout the set, surprised and delighted the audience when she sang Can It Be Done?, a song by Wilson Tee from the 1984 Weather Report album, Domino Theory, that asks a question that feels particularly poignant for Langley - is it possible to find a new sound and a new melody? Waiting until he felt confident that he could answer that question positively is one of the likely reasons Langley has taken quite so long to come forward as a bandleader and composer. And as an audience, we replied rapturously and loudly - yes you can, Noel. 7 Edentide - Langley - (ending with‘Opening’ from Kenny Wheeler’s Sweet Time Suite from Music for Large and Small Ensembles). 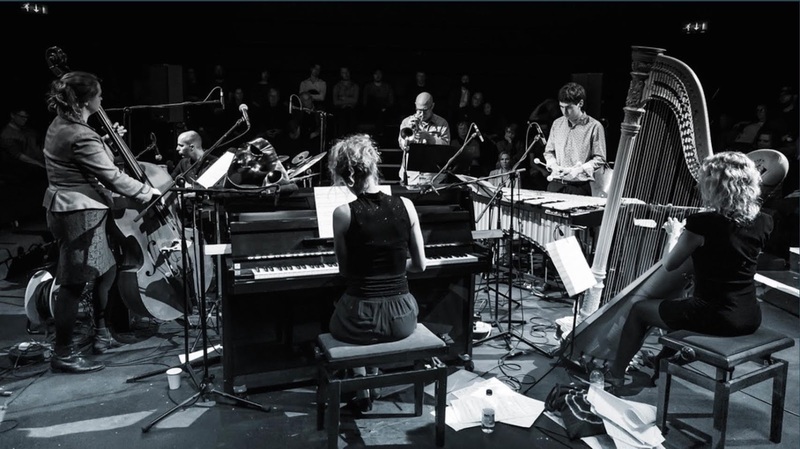 Noel Langley - Trumpet, flugel, leader, Ruth Wall - harp, Alcyona Mick - piano, Ralph Wyld - vibraphone, Charlie Pyne - bass and vocals and Asaf Sirkis - drums.